HEY READER, WE WISH YOUR A HAPPY NEW YEAR! Here on the Canary Islands we have started into the new year with a lot of sunshine, positiveness and exciting news: a dazzling new aquarium will open on 8 January, some new and old festivals will grace the islands with their presence this year and we have selected for you some of our newest holiday homes to suit our one and only new year resolution: travel more! LIEBE LESER, WIR WÜNSCHEN IHNEN EIN FROHES NEUES JAHR! Hier auf den Kanarischen Inseln haben wir mit viel Sonnenschein, Positivität and tollen Neuigkeiten ins neue Jahr gestartet: am 8. Januar wird ein wunderbares neues Aquarium eröffnet, einige neue und alte Festivals werden die Inseln im neuen Jahr zum Tanzen bringen und wir haben für Sie einige unserer neuesten Ferienhäuser ausgewählt, ganz nach unserem Motto für das neue Jahr: mehr Reisen! HOLA LECTOR, ¡ TE DESEAMOS UN FELIZ AÑO NUEVO! Aquí en las Islas Canarias hemos comenzado el año nuevo con mucho sol, positividad y noticias muy, muy buenas: un excelente nuevo acuario estará abierto al público a partir del 8 de enero, emocionantes festivales vendrán a las islas por primera vez mientras que otros volverán y además hemos seleccionado para tí algunas de nuestras casas de vacaciones más recientes, acorde a nuestra nuestra única resolución de Año Nuevo: ¡viajar más! 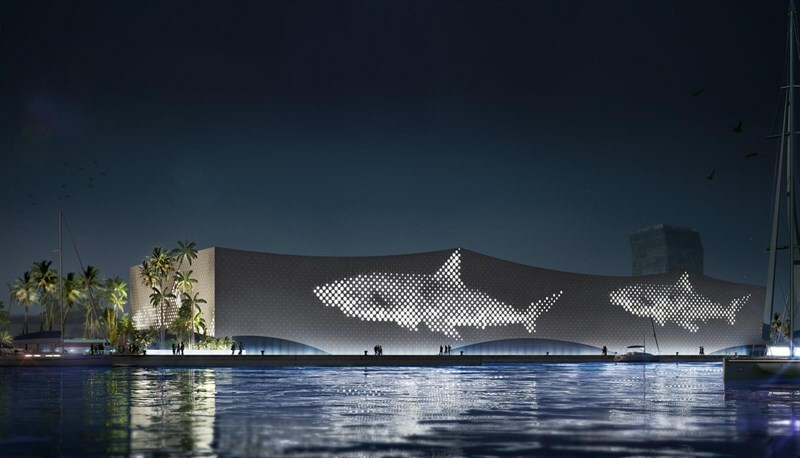 The new year starts with a big event on the Canary Islands: the stunning new aquarium Poema del Mar on Gran Canaria will open to visitors on 8 January. The aquarium presents some stunning numbers: it features the biggest curved glass screen of the world (140 tons weight, 36 meters length and 7 meters height) and it will exhibit 350 species from 35 ecosystems, among them sharks, black piranhas from Peru, freshwater stingrays and fish without eyes, but also crocodiles and lemurs. Not only the aquarium is spectacular: the building that hosts the aquarium is itself a masterpiece of modern architecture and technological innovation that uses solar panels and a modern filtration, purification and desalination system. Sun and salt water are indeed two abundant resources on the Canary Islands! The aquarium is divided into three sections: marine surface ecosystems, deep marine ecosystems and freshwater species. Visitors will start at The Jungle, which reproduces different landscapes from the five continents. After that comes The Reef, a huge cylinder that exhibits a spectacular and colourful combination of coral and fish. The visit ends at The Deep Sea offering a spectacular experience of the hidden treasures of the darkest and most unknown area of the ocean. The aquarium will also conduct local and international conservation and research projects, following the philosophy of its company, the Loro Parque Fundación, that is based on Tenerife and supports more than 100 animal conservation projects all over the world. 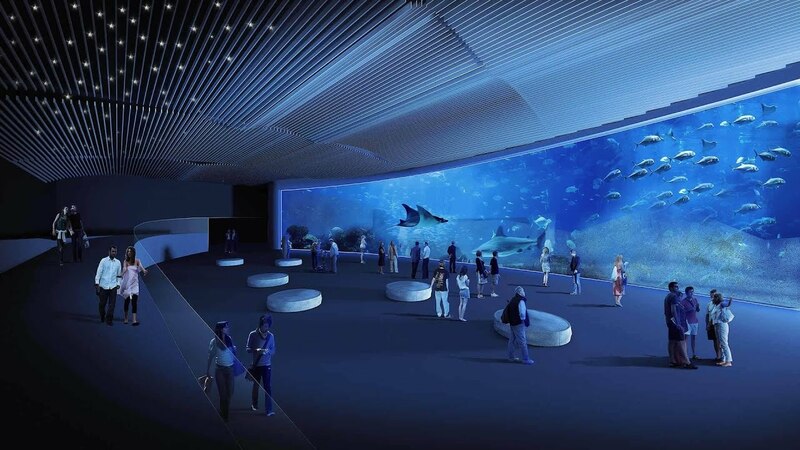 Das neue Jahr beginnt mit einem großen Ereignis auf den Kanarischen Inseln: das beeindruckende neue Aquarium Poema del Mar auf Gran Canaria wird am 8. Januar für Besucher geöffnet. Das Aquarium beeindruckt mit erstaunlichen Zahlen: es verfügt über die größte gebogene Glasswand der Welt (140 Tonnen Gewicht, 36 Meter Länge und 7 Meter Höhe) und beherbergt 350 Arten aus 35 Ökosystemen, darunter Haie, schwarze Piranhas aus Peru, Süßwasserstachelrochen und augenlose Fische, aber auch Krokodile und Lemure. Nicht nur das Aquarium ist spektakulär: das Gebäude, in dem sich das Aquarium befindet, ist selbst ein Meisterwerk moderner Architektur und technologischer Innovation, das Photovoltaik-Paneele und ein modernes Filter-, Reinigungs- und Waaserentsalzungssystem nutzt. Sonne und Salzwasser sind in der Tat zwei reichlich vorhandene Ressourcen auf den Kanarischen Inseln! Das Aquarium ist in drei Bereiche unterteilt: Oberflächenökosysteme, Tiefseeökosysteme und Süßwasserarten. Die Besucher werden in The Jungle beginnen, wo verschiedene Landschaften der fünf Kontinente reproduziert werden. Danach kommt The Reef, ein riesiger Zylinder, der eine spektakuläre und farbenfrohe Kombination aus Korallen und Fischen zeigt. Der Besuch endet in The Deep Sea, wo den Besuchern die verborgenen Schätze der dunkelsten und unbekanntesten Gegend des Ozeans offenbart werden. Das Aquarium wird auch lokale und internationale Naturschutz- und Forschungsprojekte durchführen, gemäß der Philosophie seiner Firma, der Loro Parque Fundación, mit Sitz auf Teneriffa und die mehr als 100 Tierschutzprojekte auf der ganzen Welt unterstützt. El nuevo año comienza con un gran evento en las Islas Canarias: los primeros vistantes podrán disfrutar del impresionante acuario nuevo Poema del Mar el 8 de enero en Gran Canaria. El acuario presenta algunos números deslumbrantes: presenta la pantalla de cristal curva más grande del mundo (140 toneladas de peso, 36 metros de longitud y 7 metros de altura) y exhibirá 350 especies de 35 ecosistemas, entre ellos tiburones, pirañas negras de Perú, rayas de agua dulce y peces sin ojos, pero también cocodrilos y lémures. No solo el acuario es espectacular: el edificio que alberga el acuario es una obra maestra que fusiona arquitectura moderna e innovación tecnológica y utiliza paneles solares así como un moderno sistema de filtración, purificación y desalinización de agua. ¡Sol y agua salada son dos recursos verdaderamente abundantes en las Islas Canarias! El acuario está dividido en tres secciones: ecosistemas de superficie marina, ecosistemas marinos profundos y especies de agua dulce. Los visitantes comenzarán en The Jungle, que reproduce diferentes paisajes de los cinco continentes. Luego viene The Reef, un enorme cilindro que exhibe una espectacular y colorida combinación de coral y peces. La visita termina en The Deep Sea, donde los visitantes podrán experimentar los tesoros escondidos de la zona más oscura y desconocida del océano. El acuario también llevará a cabo proyectos locales e internacionales de conservación e investigación, siguiendo la filosofía de su empresa, Loro Parque Fundación, que tiene su sede en Tenerife y apoya a más de 100 proyectos de conservación de animales en todo el mundo. If you are a culture lover, the new year has much in store for you. In 2018 the Womad festival will return to Las Palmas among some other festivals that will make the islands dance and sing, like the Womex that will grace the islands for the first time, the Bikini Pop, the Festival Cero and the International Film Festival. The Womex – the World Music Expo as well as the other festival will benefit from the multicultural backdrop that the Canary Islands offer: European islands with Spanish bonds, a close proximity to Africa and a historical and cultural connection to Latin America. But even if you miss these festivals, you can always enjoy great cultural events on the islands. There are many museums and historical buildings to be explored, the Auditorio Alfredo Kraus on Gran Canaria (named after the famous Canarian tenor) and the Auditorio de Tenerife offer great classical concerts year round and there are many concert venues featuring both international and national artists. And party lovers don’t forget: carnival season is close! February is the month where the canarios put on their most colourful costumes and get together for the best party of the year. 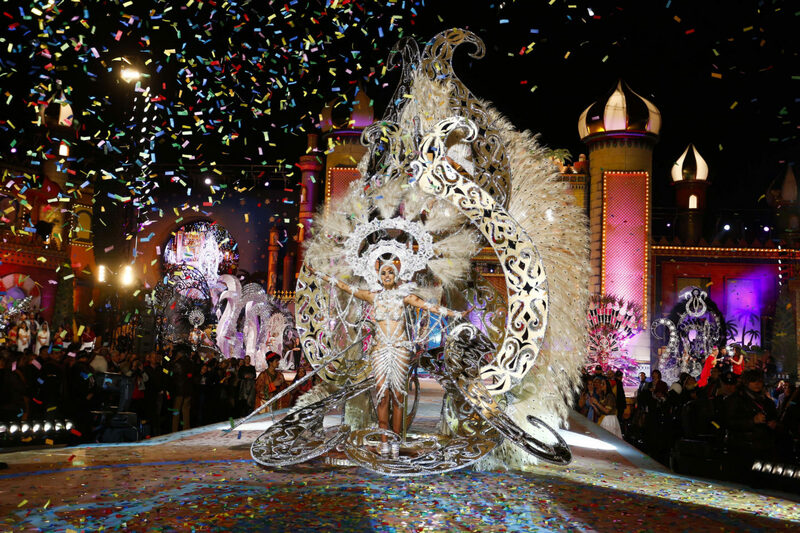 The carnivals of the two major cities of the Canary Islands, Santa Cruz de Tenerife and Las Palmas, are legendary for their colourful parades (even a drag queen is elected in Maspalomas on Gran Canaria), the two beautiful carnival queens that are elected every year and the fun and sparkling parties. Wenn Sie ein Kulturliebhaber sind, kann das neue Jahr auf den Kanaren Ihnen einiges bieten. 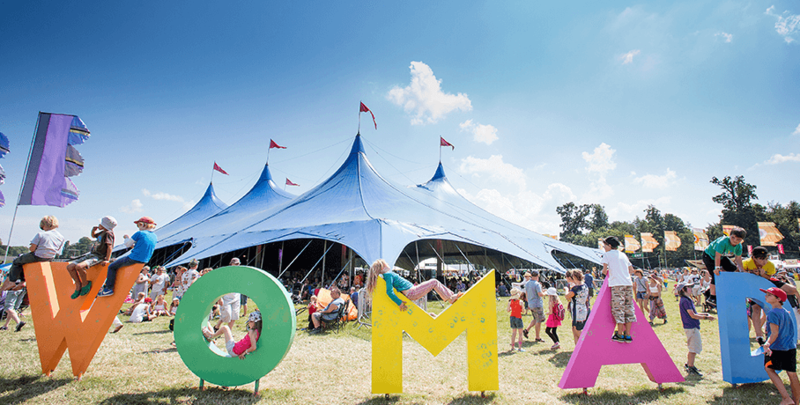 2018 wird das Womad-Festival nach Las Palmas zurückkehren, sowie andere Festivals, die die Inseln zum Tanzen und Singen bringen werden, wie das Womex, das zum ersten Mal auf die Inseln kommt, das Bikini Pop, das Festival Cero und das Internationale Filmfestival. Die Womex – die World Music Expo – sowie die anderen Festivals werden von der multikulturellen Kulisse der Kanaren profitieren: europäische Inseln mit spanischer Prägung, nahe am afrikanischen Kontinent und einer einzigartigen historischen und kulturellen Verbindung mit Lateinamerika. Aber selbst wenn Sie diese Festivals verpassen sollten, können Sie zu jeder Jahreszeit großartige kulturelle Veranstaltungen auf den Inseln genießen. Es gibt viele Museen und historische Gebäude zu entdecken, das Auditorio Alfredo Kraus auf Gran Canaria (benannt nach dem berühmten kanarischen Tenor) und das Auditorio de Tenerife bieten das ganze Jahr über klassische Konzerte und auch viele internationale und nationale Künstler zieht es auf die Inseln des ewigen Frühlings. Und für Partyliebhaber naht das Highlight des Jahres: die Karnevalsaison! Der Februar ist der Monat, in dem die Canarios ihre farbenprächtigsten Kostüme anziehen und sich für die beste Party des Jahres versammeln. Die Karnevals der zwei großen Städte der Kanarischen Inseln, Santa Cruz de Tenerife und Las Palmas, sind legendär für ihre farbenfrohen Paraden (sogar eine Drag Queen wird in Maspalomas auf Gran Canaria gewählt), die beiden wunderschönen Karnevalsköniginnen, die jedes Jahr gewählt werden, und die spektakulären glitzernden Partys. Si eres un amante de la cultura, el nuevo año en las Islas Canarias tiene mucho que ofrecerte. En 2018, el festival Womad volverá a Las Palmas, entre otros festivales que harán bailar y cantar a las islas, como el Womex que vendrá a las islas por primera vez, el Bikini Pop, el Festival Cero y el Festival Internacional de Cine. El Womex – World Music Expo – y el resto de festivales se beneficiarán del telón de fondo multicultural que ofrecen las Islas Canarias: islas españolas y europeas con una singular cercanía al continente africano y una conexión histórica y cultural con América Latina. Pero incluso si te pierdes estos festivales, puedes disfrutar de grandes eventos culturales durante todo el año en las islas. Hay muchos museos y edificios históricos que explorar, el Auditorio Alfredo Kraus en Gran Canaria (llamado así por el famoso tenor canario) y el Auditorio de Tenerife ofrecen espectaculares conciertos clásicos durante todo el año y numerosos artistas nacionales e internacionales visitan las islas de la eterna primavera. Y para los amantes de las fiestas se acerca el evento más esperado del año: ¡la temporada de carnaval está cerca! Febrero es el mes en que los canarios se ponen sus disfraces más coloridos y se reúnen para la mejor fiesta del año. Los carnavales de las dos principales ciudades de las Islas Canarias, Santa Cruz de Tenerife y Las Palmas, son legendarios por sus coloridos desfiles (incluso una drag queen es elegida en Maspalomas en Gran Canaria), las dos hermosas reinas del carnaval que se eligen cada año y las fiestas divertidas y chispeantes. OUR ONE AND ONLY NEW YEAR RESOLUTION: TRAVEL MORE! Travel is a source of happiness and inspiration, that lets you connect with other cultures, discover exciting places and get away from your daily routine. But during your travels it is also important to take time to relax and find your inner peace. Because of that we believe that a beautiful holiday home is essential for a great holiday. We have selected three stunning holiday homes that have been recently added to our portfolio and that will definitely be a great idea for your holidays in 2018! 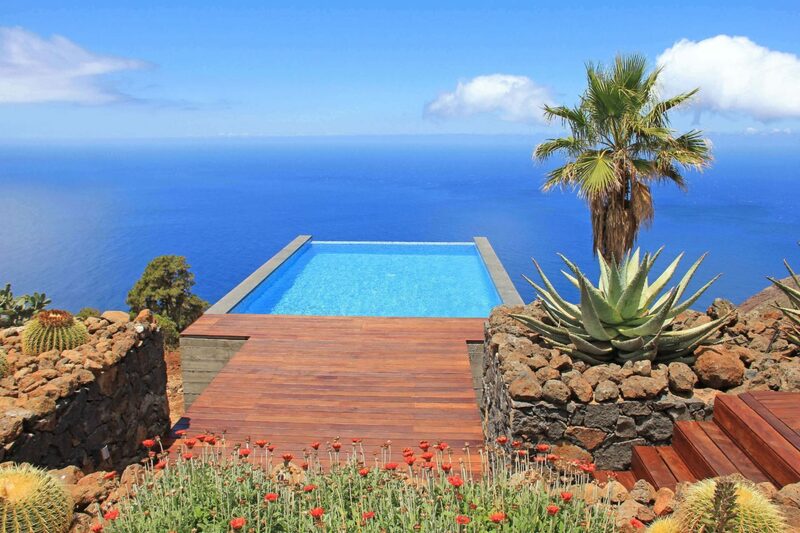 Villa Infinite Place is definitely a bucket list villa: modern design, private pool with truly infinite ocean views and located on the most beautiful of the seven islands (La Palma is called La Isla Bonita, the beautiful island, because of its stunning landscapes). Villa Imperial La Menta is another of our new favorites: this stunning three-bedroom-villa with private pool is located next to the golf course Salobre Golf in the popular south area of Maspalomas, a green oasis close to the golden sand beach beaches of the island. And our third pick are the Villas Mirador, that are located directly at one of the most stunning beaches of the Canary Islands: Playa Costa Calma on Fuerteventura – just grab your towel and step out of the house onto the golden sand! Reisen ist eine Quelle des Glücks und der Inspiration, die es Ihnen ermöglicht andere Kulturen kennen zu lernen, aufregende Orte zu entdecken und Ihrer Alltagsroutine zu entkommen. Aber während jeder Reise ist es auch wichtig, sich Zeit zu nehmen, um sich zu entspannen und seinen inneren Frieden zu finden. Aus diesem Grund glauben wir, dass ein schönes Ferienhaus für einen erholsamen Urlaub unerlässlich ist. Wir haben drei atemberaubende Ferienhäuser ausgewählt, die kürzlich unser Portfolio erweitert haben und die sie jetzt schonmal für Ihren Urlaub im Jahr 2018 inspirieren können! Villa Infinite Place ist auf jeden Fall eine bucket-list Villa: modernes Design, Privatpool mit unendlichem Meerblick und Toplage auf der schönsten der sieben Inseln (La Palma heißt La Isla Bonita, die schöne Insel, wegen ihrer atemberaubenden Landschaften). Villa Imperial La Menta is auch eine unserer neuen Favoriten: diese bezaubernde drei-Schlafzimmer-Villa mit Privatpool befindet sich am Golfplatz Salobre Golf im beliebten Süden von Maspalomas, eine grüne Oase in der Nähe der goldenen Sandstrände der Insel. Und unsere dritte Wahl sind die Villas Mirador, die direkt an einem der schönsten Strände der Kanaren liegen: Playa Costa Calma auf Fuerteventura – schnappen Sie sich einfach Ihr Handtuch und treten Sie aus dem Haus auf den goldenen Sand! Viajar es una fuente de felicidad e inspiración, que te permite conocert culturas nuevas, descubrir lugares emocionantes y desconectarte de tu rutina diaria. Pero en cada viaje también es importante tomarse un rato para relajarse y descansar. Por eso creemos que una hermosa casa de vacaciones es esencial para unas buenas vacaciones. Hemos seleccionado tres impresionantes casas de vacaciones agregadas recientemente a nuestro portafolio y que definitivamente son una idea genial para las vacaciones de 2018. Villa Infinite Place es una villa que deberías estar en tu bucket list: diseño moderno, piscina privada con infinitas vistas al mar y ubicada en la más hermosa de las siete islas (La Palma también es conocida como La Isla Bonita debido a sus impresionantes paisajes). 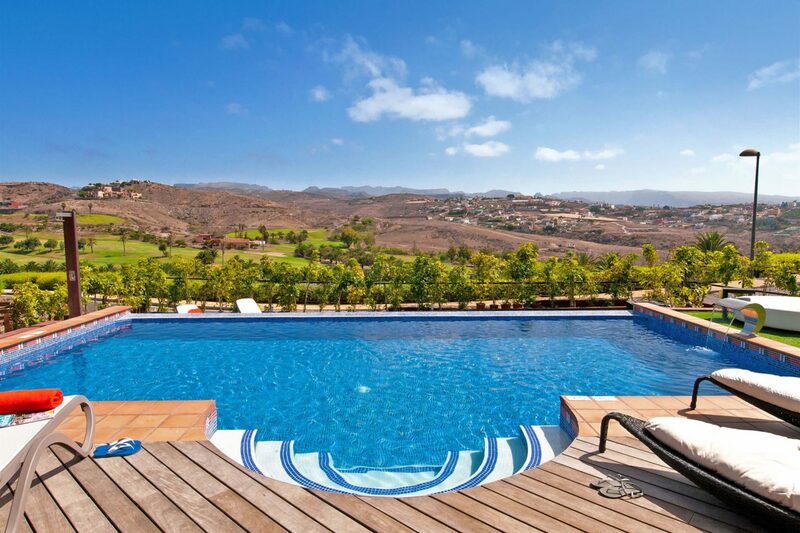 Villa Imperial La Menta es otra de nuestros nuevas favoritas: esta impresionante villa de tres dormitorios y piscina privada se encuentra junto al campo de golf Salobre Golf en la popular zona sur de Maspalomas, un oasis verde cerca de las playas de arena dorada de la isla. 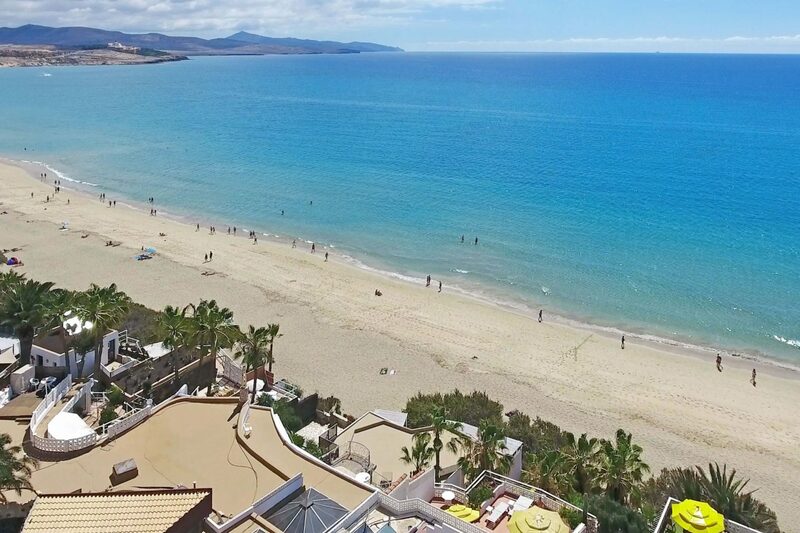 Y nuestra tercera elección son las Villas Mirador, que se encuentran directamente en una de las playas más impresionantes de las Islas Canarias: Playa Costa Calma en Fuerteventura: ¡toma tu toalla, sal de la casa y ya estarás en la playa! Next Post Ready for Spring 2018?